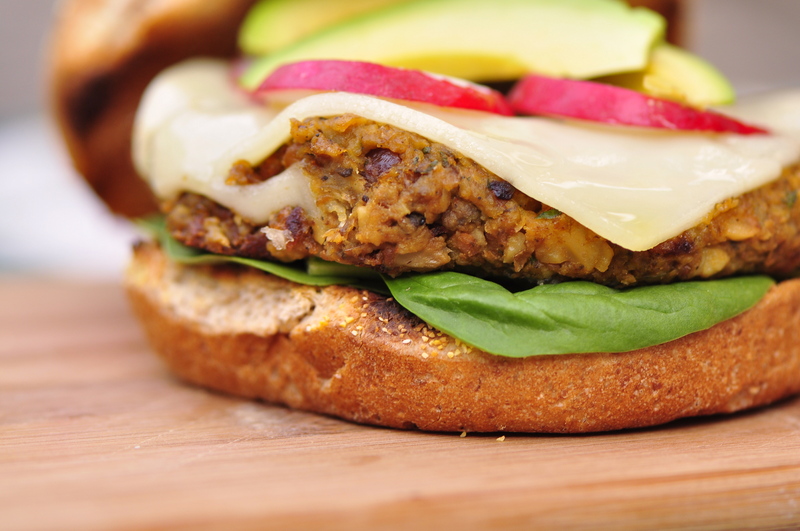 This is not your average veggie burger. 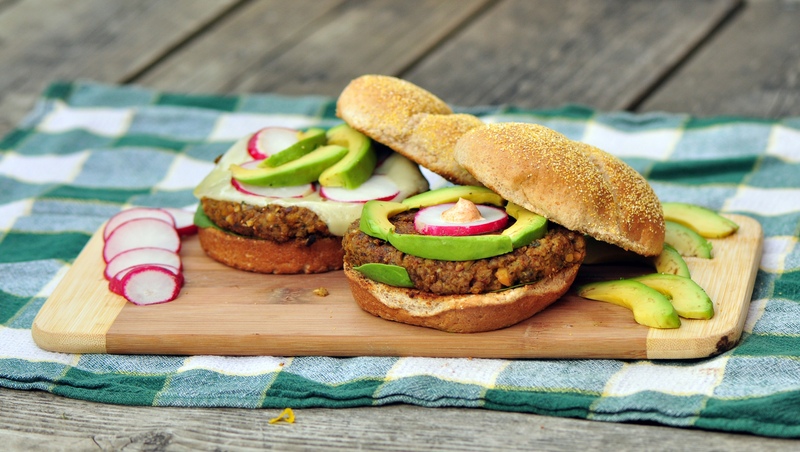 Lentils and cashews give this burger the substance to be protein-packed and filling, while the curry and coriander give a big kick of flavour. 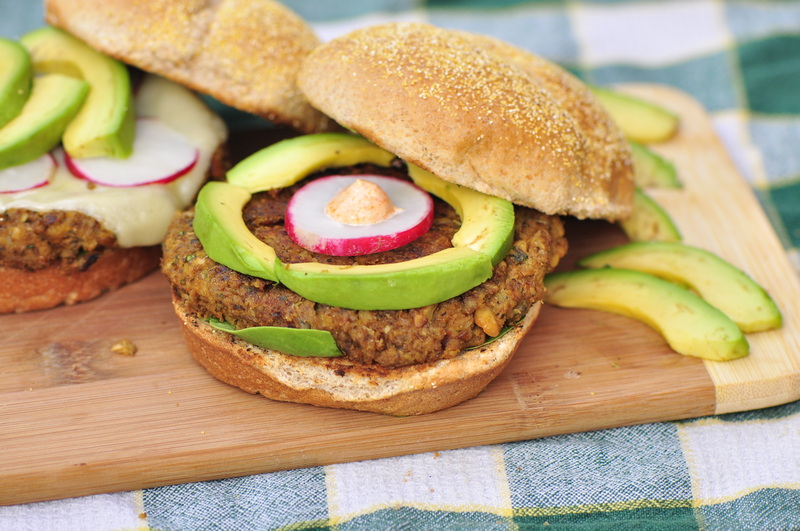 I normally don’t bother with a bun when I’m eating burgers at home, but these ones are nice with fresh burger buns, topped with radish, avocado, cheese and whatever else you want. I put a bit of chipotle mayo on the tops of mine as well—can’t go wrong. This recipe is from the Canadian Living Vegetarian Collection, my favourite all-veg cookbook. I have used oats instead of breadcrumbs, but if you prefer to use breadcrumbs, that’s what I used this time (it’s also what they call for in the original recipe) and it works well too. 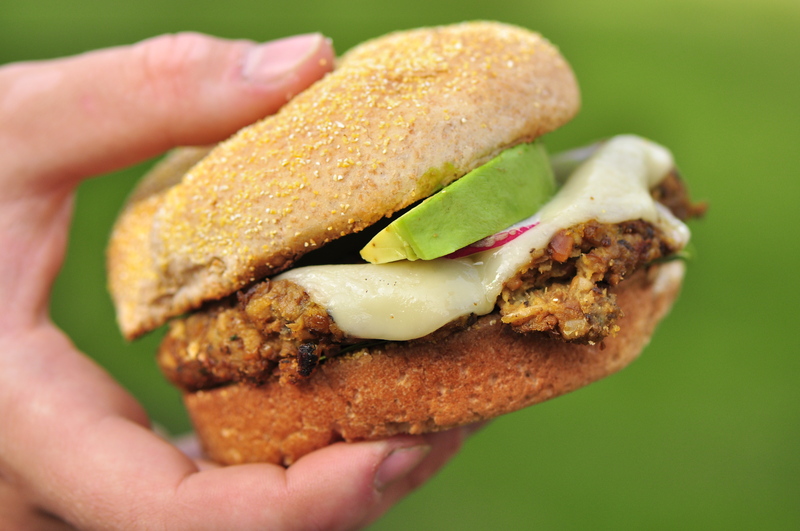 Sidenote: There’s one exception to the store bought veggie burgers. President’s Choice makes a Portobello Swiss Burger which is really yummy (although it’s still soy-based), but it’s easier to barbecue than homemade ones because they stay together really well. Oh. Wow. I love this recipe! Pretty much anything with cashews is a must-make for me, and the pics are mouthwatering! Thanks very much! The cashews are a great additive–I was afraid they might be a bit dry but with the mushrooms and everything else it balanced out nicely. Every now and then I’ll browse the “Food” section, but rarely will I find something that I’ll actually end up eating. This could end up being one of those, though! Looks delicious and more importantly, healthy! I’m glad it sparked your interest! This looks wonderful. Goodness. I want to eat it now. I have to admit, it was 🙂 thanks! This looks sooo good! *drooling*. Hi! These look delicious and I’m totally going to make them. What did you use for the curry paste? Red curry paste? My spouse and I stumbled over this recipe and thought I should check things out. I like what I see so I am just following you. Look forward to reading more! This is amazing! I used kidney beans instead of lentils, soaked the cashews in water instead, and zucchini/pepper instead of mushrooms — didn’t have much in the fridge this week… — and it turned out delicious! I think it is a very versatile recipe, you can just throw in whatever and it is great. Could use many different spices for flavours too. Glad to hear it turned out with the substitutions!